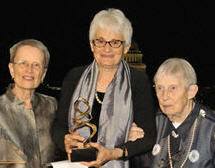 Four outstanding contributors to public health, medicine, and health communications were recognized at the Friends of the National Library of Medicine (FNLM) 2012 Awards Gala. The annual event, which brings together people from throughout the health care community, was held September 11 in a rooftop garden overlooking the US Capitol. The FNLM noted the four awardees are exemplary in their service to others, so it was fitting they were honored on September 11, the National Day of Service and Remembrance. 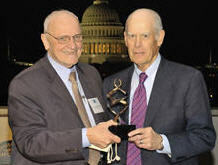 Former Illinois congressman John Porter was recognized for his public service. Porter chaired the House subcommittee on Labor, Health and Human Services, and Education and currently chairs Research!America. He was honored with the Paul G. Rogers Award for Public Service and Communications. Known as “Mr. Health,” Rogers was a staunch supporter of the National Institutes of Health and a good friend to the National Library of Medicine. Alfred Sommer, MD, MHS, a researcher who studies strategies to prevent blindness, received the Distinguished Medical Science Award. 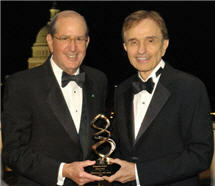 “The National Library of Medicine has been there for me for my entire career,” Dr. Sommer noted in accepting the award. Sommer is the Dean Emeritus of the Bloomberg School of Public Health and a professor of ophthalmology, epidemiology and international health at Johns Hopkins School of Medicine. Karen Hunter, Senior Vice President Emeritus-Elsevier, received the Distinguished Health Communications Award. Ms. Hunter, who was unable to attend the event, has been recognized by both the library and publishing communities as an innovator and thought-leader. She has actively championed a range of projects addressing the challenge of archiving digital information. Anna Ercoli Schnitzer, AMLS, received the Michael Debakey Library Services Outreach Award. Schnitzer is a librarian at the University of Michigan’s Taubman Health Sciences Library. She specializes in disability issues. September 17, 2012 in Events.